Owner reported max speed as an estimate. Double masted: Sitka Spruce spars. 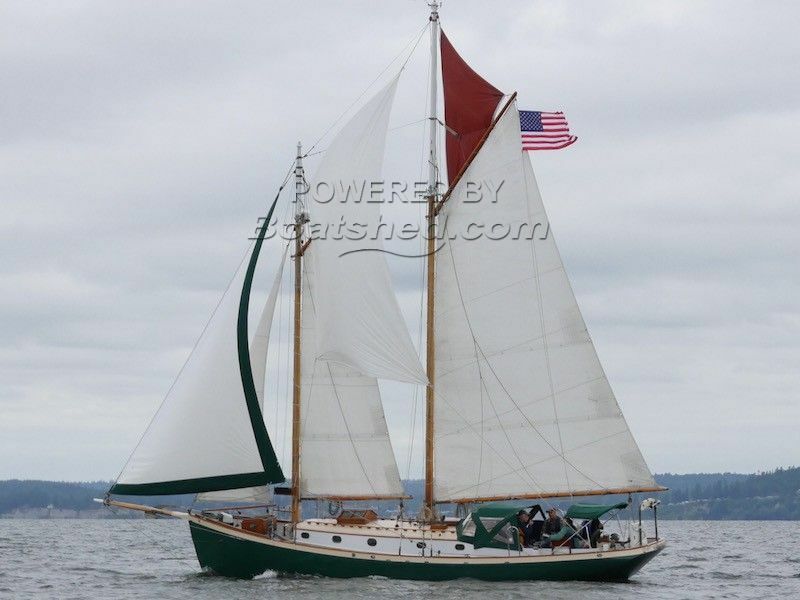 She is a Gaff Schooner rig with approximately 699 feet of working sail area. The triatic stay is Dyneema. All sails are dacron and include: gaff main and foresail, club footed staysail, Harken roller furling jib, main gaff topsail, fisherman staysail and large genoa. Additionally, there are two storm sails. New whisker stays - 2017. Fuel tank: stainless steel, located outboard of head (starboard). Water tank: stainless steel, located outboard of pantry and cabinet (port). Small accumulator tank in lazarette. Holding tank: polyurethane, located under cockpit sole. "Y"-valve and macerater. Waterline Boats / Boatshed did not independently verify capacities, dimensions, or fuel consumption figures described in this listing. Information is derived from seller-provided information and/or literature. Stepping aboard this beauty, inspired by the pilot schooners built on the east coast of the US in the 19th and 20th centuries, I felt a sense of history, pride of ownership, and marveled at the care and condition of this vessel. Beginning my description in the cockpit, there is room to comfortably accommodate six adults. The story of the original owner, for whom this boat was built, is that he appreciated the Stadel 36 but wanted more space for entertaining. Therefore, this redesigned, custom gaff schooner was “stretched” for a larger cockpit. The central pedestal houses the Garmin chartplotter and the binnacle, while the engine instruments are set into the cockpit bulkhead beside the pedestal. To supplement the chartplotter, there is a Garmin GNX20 instrument on the aft cabin bulkhead, which displays either wind or depth. Steering is via an Edson worm gear mechanism, with an aft-mounted mahogany wheel. Cockpit seats open for large locker storage to port and starboard for equipment storage, small accumulator tank, and compressor for the fridge/freezer. The cockpit sole allows access to the 4-108 Westerbeke 37hp diesel engine as well as access under the companionway stairs. A dodger and bimini help keep the cockpit crew dry, and can be connected if desired. The companionway doors and hatch were custom crafted with leaded windows by the current owners in 2012; the stairs were also changed to accommodate easier movement in the galley area. Entering via the companionway, the galley is to port. A quarter berth for two, with the ship's electrical distribution panel is to starboard. There is a folding table/work surface next to the quarter berth for writing or helping prepare a meal. The galley is equipped with a beautiful custom foldaway work surface over a 2-burner Origo alcohol stove, and an AC powered Cuisinart toaster oven. The galley and quarter berth are heated by a hydronic-heating loop using engine heat. Kitchen and eating utensils are stored above the stove; pots, pans, etc. may be stored in a large drawer below the stove. There is a built-in fridge and freezer with horizontal door access; outboard is the dish and glassware storage, behind caned doors. A Caframo fan helps diffuse cooking smells. The sink has a pull-down faucet for hot and cold water, and is also equipped with a pressurized seawater system. Forward of the galley, to port, is a large pantry with LED lighting inside and a caned door to facilitate air movement and a large set of drawers. A vertical fresh water tank is located outboard of the pantry and drawers. Opposite the drawers and pantry is the head. The head, remodeled in 2010, is equipped with a ceramic corner sink, scavenged from a tugboat, a manual Raritan PHII toilet (with a hydronic heater behind it), and a hand-held fresh water shower with both hot and cold water. The vertical fuel tank is located outboard of the head. Continuing forward to the saloon: a kerosene Sig Marine 100 cabin heater is located to starboard. It is equipped with a day tank, and a chimney heat recovery device and fan to help keep the boat cozy in cold weather. There are facing settee/berths, with storage underneath. Recessed LED lighting is discreetly located above the settees. Lead ballast is behind the settees and below the saloon sole. The saloon/dinette table is a custom-built folding table that mounts to the forward bulkhead, and has a single leg when in use. It easily stores away beside the base of the foremast to create additional space in the saloon area. The cabin has a V berth forward, with a mattress to starboard. Current owner uses port side for sail storage. A mattress could easily be installed if needed. There are two opening skylights with opening port lights throughout which allow beautiful natural lighting. Forward of the V-berth is anchor chain storage, holding 300’ of 5/16” chain secured behind a covering for easy access. Delta anchor - 44 lbs. Anchor and chain pressurized washdown located at bow. No halyard winches as not necessary due to block and tackle set up. Garmin chartplotter and GNX 20 (wind and depth). An iconic, classic wooden schooner. Built of Honduras mahogany, oak frames, teak decks and Sitka Spruce spars. This boat appears incredibly well-maintained and had new bottom and topsides paint May 2017. Current owners completed many custom upgrades to complement her beauty and functionality specifically for cruising: new companionway doors with leaded windows, remodeled the head, upgraded heating system and water system, custom dinette. She was designed by George Stadel, Jr. and built by George "Sonny" Hodgdon in 1977, and commissioned in 1978. A truly unique boat for those who love classic wooden sailboats but want the benefits of a more modern build with contemporary upgrades. Certain to be an admired vessel in any port. This Stadel Gaff Topsail Schooner 38 has been personally photographed and viewed by Gretchen Miles of Boatshed Everett. Click here for contact details.